Walker v. Sons of Confederate Veterans: The Supreme Court confronts the ugly power of the Confederate flag. The justices rule on a Confederate flag case as the nation once again grapples with the ugly power of that racist Southern symbol. The license plate in question. 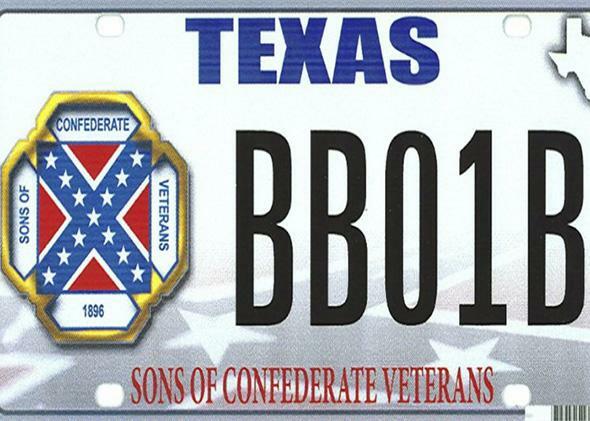 The nine Justices on the Supreme Court wrote their opinions and dissents in Walker v. Texas Division, Sons of Confederate Veterans Inc.—a major speech case over Texas’ right to reject license plates emblazoned with the Confederate flag—without ever imagining that a white racist who posed in front of a car with a Confederate license plate would assassinate nine people in a historic Charleston, South Carolina, church, mere hours before the opinion would be read aloud. None of the nine justices could have known that this decision would come down just as the Internet was blowing up with accusations that South Carolina has both honored and welcomed hate with its determined embrace of the Confederate symbol on state property. But at some level, Justice Samuel Alito must be at least a little bit grateful that his rip-snortingly funny dissent about specialty plates (“If a car with a plate that says ‘Rather Be Golfing’ passed by at 8:30 am on a Monday morning, would you think: ‘This is the official policy of the State—better to golf than to work?’ ”) didn’t make the headlines this morning. This is hardly a “liberal” legal proposition, per se, and that fact is amplified by the decision of Justice Clarence Thomas, probably the court’s staunchest conservative, to join the court’s traditional left wing without explaining why, on a day in which his separate, often biting concurrences and dissents flowed freely in other cases. The court is often accused, including by me, of failing to take reality into account, and hiding behind legal abstractions, jargon, and three-part tests in the face of genuine human pain and suffering. But Walker is a case in which the opposite happened—the court had the ugliest version of the Confederate flag draped over its rather dry, analytic decision. And the First Amendment question, while a close one—both Breyer and Alito are persuasive, and Alito even more so—looks like a harder case today, precisely because Thomas’ experience with symbols of hate and violence is far more salient for many of us than Alito’s uncharacteristically hilarious riff on golf. Perhaps this shouldn’t matter. If every speech case were decided against the immediate backdrop of our worst tragedies and their ugliest public symbols, the court would never have protected the speech rights of the Westboro Baptist Church, or violent video game–makers, or neo-Nazis, or Larry Flynt. But the two enduring messages of this week’s accidental timing with respect to the Confederate flag are paradoxical: On the one hand, what happens in the real world doesn’t matter and it shouldn’t matter. This case was decided based on abstract principles, and whether the result is correct or not should also be decided dispassionately. But the second lesson is more complicated and it’s this: One man’s license plate is another man’s visceral threat, one man’s free speech is another man’s assault, and even Supreme Court justices—even when they’re deciding cases on the most technical principles of government speech versus motorist speech, or whether a license plate is more like a bumper sticker or a monument—might look to their own experiences of hate, personal identity, and incivility for their answers. The court may well have come to the wrong decision in Walker, although it was perhaps the right decision for the America in which we find ourselves today. One more lesson that I’m hoping the court might take from our current bookended public conversations about the Confederate flag and the ways in which it continues to roil and divide us: I hope it will be a bracing reminder to the justices that much as we might wish to believe, in the famous words of Chief Justice John Roberts, that “the way to stop discrimination on the basis of race is to stop discriminating on the basis of race,” we aren’t there yet.